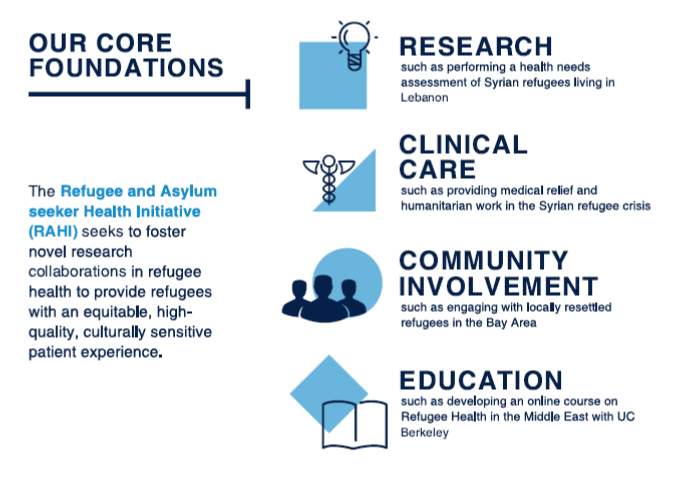 The Refugee and Asylum seeker Health Initiative (RAHI) encompasses all clinical, research, educational, and academic activities related to refugee and asylee health at the University of California, San Francisco (UCSF). RAHI seeks to develop sustainable, evidence-based clinical interventions for refugees and asylees, and to address the shortage of rigorous research in refugee health, which has led to a lack of evidence-based clinical practice resulting in inferior health outcomes in this population. Ultimately, RAHI aims to foster high-quality refugee health research in order to improve the quality of refugee healthcare. How will your support help RAHI? We are immensely proud of all that RAHI has accomplished, but it is important to note that everything RAHI has done thus far has been on a volunteer basis, without any funding or budget whatsoever. All RAHI members are volunteering their own personal time and resources to realize RAHI's potential, because we believe in its purpose and importance for the community locally and internationally. This labor of love helped us realize how much more we could accomplish if we had funding to achieve even bigger goals. Your gift will help fully launch the initiative and enable RAHI to reach its full potential. This includes organizing new teams to help in the emerging refugee crises of the Rohingya and Yemeni populations; launching new research projects and clinical interventions in the Syrian refugee crisis that have been unable to start due to lack of funding; developing our online presence; and supporting RAHI's local and international research and awareness events. Every little bit helps-- thank you for your support! The Refugee and Asylum seeker Health Initiative (RAHI) is a grassroots organization founded by Dr. Fatima Karaki, a physician at the University of California, San Francisco, who works with refugee populations locally and internationally. After witnessing firsthand the massive humanitarian crisis of Syrian refugees in the Middle East and Europe, the large number of refugees and asylum seekers in the bay area, and the need for inclusion of minority researchers, physicians and community members from those vulnerable populations, Dr. Karaki established RAHI. She envisioned a holistic approach that incorporates evidence-based medical research, cultural competency, social determinants of health, and international collaboration to improve medical care and health outcomes for refugees and asylum seekers around the world. When Dr. Karaki first started working with refugee populations as a physician volunteer abroad, she was shocked by the massive scale of the refugee crisis and the vast numbers of vulnerable patients she encountered. She witnessed refugees who could not access sorely needed medical care, not simply due to lack of medical personnel or lack of medications, but for much deeper reasons that required a more thoughtful and long-term approach: lack of knowledge about the host country, difficulties with shipping and receiving donated supplies, language and cultural barriers, socioeconomic discrepancies, and discrimination. Additionally, she observed that virtually all volunteers in the refugee crisis were appalled at the level of waste and redundancy seen with humanitarian and non-governmental organizations, both large and small. Often, she noted that huge sums of money donated to organizations resulted in minimal or no measurable results for the refugees themselves. RAHI was founded in recognition of the fact that the complexities of the refugee crisis require intensive study and research in order to design and implement sustainable solutions to address these issues. We believe that refugees deserve high-quality medical care with excellent patient outcomes, and we recognize that to provide such care, we first need to research and understand the underlying causes in order to develop solutions. The Refugee and Asylum seeker Health Initiative's mission is to improve the health of refugees and asylum seekers through our four core foundations: clinical care, research, education, and community involvement. 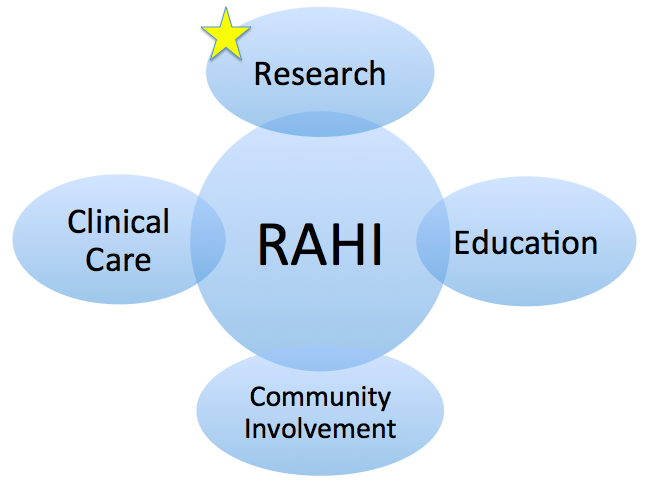 RAHI's vision is to foster novel research collaborations in refugee health in order to enable evidence-based clinical interventions that improve the quality of medical care, and thus provide refugees with an equitable, high-quality, culturally sensitive patient experience. Our projects are evidence-based and draw upon our original research outcomes. We are committed to addressing the thirst for knowledge of our UCSF trainees by creating residency and graduate student curricula in refugee health. Community engagement and social awareness are important priorities within the initiative. The foundation of RAHI is its broad community support, and these relationships will foster improved patient satisfaction, outcomes, access and flow. Using each of these arms synergistically will catalyze improvements in research, education, and care of this population. RAHI is founded and led by women of color from disadvantaged backgrounds and seeks to empower and engage students, residents, and faculty who originated from these communities and wish to ‘give back.’ We explicitly seek to mentor, develop, and promote these groups. It is multidisciplinary, with members comprising UCSF faculty from various departments (hospital medicine, internal medicine, family medicine, pediatrics, psychiatry, OBGYN); UCSF staff, residents, medical students and graduate students; Department of Public Health; ZSFG Refugee Clinic, 6M Bridges Clinic, and Newcomers Program; and refugee resettlement and community organizations; in addition to other students and community members from the University of California and the wider Bay Area. RAHI is the only initiative of its kind focused on our refugee and asylee population on the West Coast. It provides a formal opportunity for UCSF to lead the development of solutions to the refugees global crisis, and to fill the void in leadership in the field of refugee health. We believe that the development of sustainable solutions in refugee health is most likely to be successful when it is initiated and implemented by the affected communities themselves. We partner with local universities and grassroots organizations on the ground in host countries. Our researchers and clinicians share the same ethnic, linguistic and cultural background as their patients, and this enables a uniquely culturally and socially aware level of research and medical care. Through the works of dedicated RAHI members and supporters we have been able to establish a presence at UCSF, based at Zuckerberg San Francisco General Hospital (ZSFG). A landscaping exercise of the UCSF community ensures that we spread awareness and are inclusive of all current research and clinical activity in refugee and asylee health at UCSF. 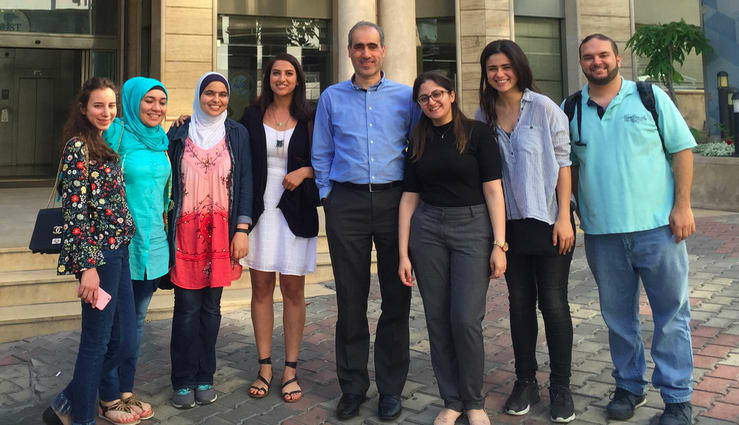 Numerous research projects and publications are underway, including completion of an IRB-approved project working with Syrian refugees in a Palestinian camp in Beirut, Lebanon. Website is under construction for our full list of current projects and publications. Our work has been presented at the North American Refugee Health Conference and the UCSF Annual Health Disparities Research Symposium. RAHI hosted guest speaker Dr. Zouhair Attieh, Dean of the Faculty of Health Sciences at the American University of Science and Technology in Beirut, at the Global Health Sciences Department at UCSF Mission Bay, for his talk entitled "Syrian Refugee Healthcare in Lebanon: Where did we go wrong?" 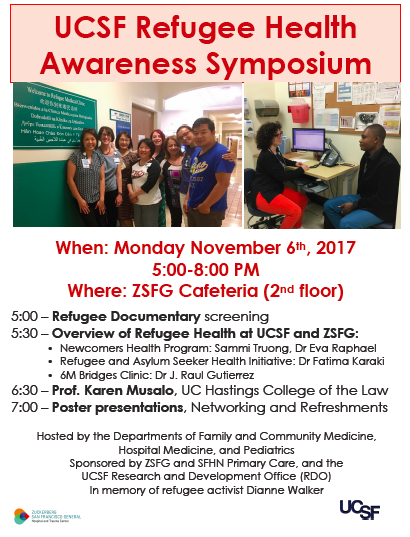 The first annual Refugee Health Symposium at UCSF will be hosted by RAHI at ZSFG on November 6.